2017 Conventional Loan Guidelines: Is It Right For Me? Now the assumptions are if you have decent credit scores, a sufficient down payment, and no derogatory items on your credit report then you should be choosing a Conventional Loan and in this article we are going to go over the 2017 Conventional Loan Guidelines. Now Conventional Loans are loans that abide by the guidelines set forth by Fannie Mae and Freddie Mac who are the two GSE’s or Government Sponsored Enterprises in charge of creating the guidelines for Conventional Loans. Conventional Loans are also referred to as conforming loans because they must abide by the guidelines by Fannie Mae or Freddie Mac in order for the loan to be approved, closed, and sold on the secondary market after closing if your lender doesn’t keep the loans they close in house. In recent years Conventional Loans have tried to compete with FHA Loans from a down payment standpoint as they have loan programs where you can obtain a home with as little as 3% down payment in direct response to FHA Loans which have a minimum down payment requirement of 3.5%. 2017 Conventional Loan Guidelines: 2017 Sees Loan Limits Rise! District of Columbia, Hawaii, and U.S.
As you can see, for a standard 1 unit home the increase is $7,100 from prior years with an increase to $424,100 from $417,000. As long as there isn’t another recession that comes down on the economy, home values should continue to rise and we may see loan limits increase every year or every couple years going forward. – As mentioned earlier in this article, with Conventional Loans having programs to get borrowers into loans for just 3% down payment, this is in direct competition to FHA Loans which are at 3.5%. Historically Conventional Loans needed at least 5% down payment, but with the changes in late 2014, this is a thing of the past. – There is Private Mortgage Insurance or PMI included in your monthly mortgage payment as long as your loan-to-value or LTV is above 80%. However, unlike FHA Loans that have mortgage insurance paid for the entirety of the loan, PMI automatically drops off Conventional Loans after LTV is below 80%. PMI also decreases the lower your LTV is so someone with a 95% LTV will pay more per month than someone with an 85% LTV. – Conventional Loans directly reflect your credit worthiness and their mortgage rates adjust accordingly. Unlike government insured loans that rarely change with credit scores and down payment, this can’t be said for Conventional Loans. For example, a borrower with a 740 FICO and 20% down payment will get nearly the best rate possible while a borrower with 640 FICO and 5% down payment will have their mortgage rate adjusted up accordingly to the risk. This is where if you are a solid borrower with a high credit score and down payment, you are in great shape to receive one of the best rates available. – Conventional Loans differ from the government insured loans by allowing loans to be used for both second homes and investment properties. This is good for borrowers with the ability to afford multiple homes or borrowers who are investors. Down payments required for second homes is 10% while investment properties will require 15%-20% down payment. 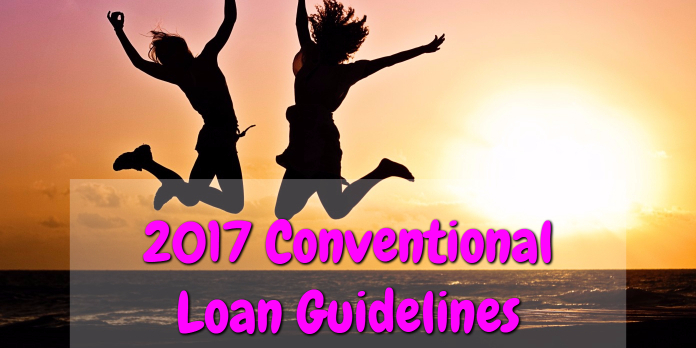 If you’d like to see the details on the remaining 2017 Conventional Loan Guidelines, you can find them in the list below and as always, if there are any questions you should come across, please reach out to me ASAP at 888-900-1020 or contact@loanconsultants.org. – Credit Score: The minimum credit score required for a Conventional Loan is 620 FICO, however, you may run into lenders that require 640 or even 660. This is known as lender overlays which are additional requirements put on borrowers by lenders who don’t want to take on the risk of lending to minimum qualifications. Loan Consultants can offer no lender overlays and we can definitely get deals done to the minimum FICO requirements. Now 620 FICO may be the minimum, but as mentioned earlier if you are looking for the best rates possible then you need to ensure you have at least a 740 FICO. – Debt-To-Income Ratio: DTI Ratio varies depending on if you are going with a Fannie Mae program or a Freddie Mac program. In the case of Fannie Mae you are required to have a DTI Ratio no higher than 45%. For Freddie Mac loans you are required to have a DTI Ratio that does not exceed 50%. Backend DTI Ratios are calculated by taking the proposed mortgage payment and all other monthly debt obligations and dividing it by your gross monthly income. – Bankruptcy and Foreclosure: There are many different waiting periods associated with the 2017 Conventional Loan Guidelines and how they treat derogatory items. The list below will outline the different scenarios you can run into as a borrower. Deed-In-Lieu of Foreclosure: 4 year waiting period from the recorded date. 2017 Conventional Loan Guidelines: Work With The Best! Working with us you will witness first hand that we do not have lender overlays on Conventional Loans and we can get your loan processed to the minimum 2017 Conventional Loan Guidelines. If you are currently working with a lender who you feel has overlays or cannot get your loan closed in 30 days or less, then you need to call us today so we can get your file started ASAP. I can be reached at 888-900-1020. We are always here to help you and you can call me day, night, weekends, and holidays and I will be here to serve you, the customer!